Thought I’d share this beautiful coat rack fail with you, just to show you I’m not perfect and I can’t do EVERYTHING (in case you did actually believe that). 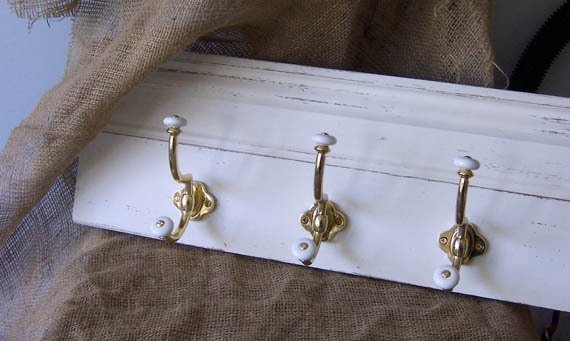 I had this brilliant idea that I could make a cute coat rack using these antique style brass coat hooks I’d gotten on sale a long time ago. I had this small piece of old skirting board which was perfect. How hard can it be? Harder than I thought, turns out. Firstly, I didn’t measure correctly. Sure the hooks were evenly spaced, but I forgot to take into consideration the space on the ends… that should have been smaller and the space between should have been bigger. Then I couldn’t get the darn screws in properly so that the plates sat flat! I tried all kinds of things… every effort digging me deeper into the quagmire of failure. The skirting board was hardwood… the drill too strong… the screw heads just popped off left right and centre. I gave it to Wayne and asked if he could fix it. He broke the timber and gave me the hooks to use on another project. I dont know if I can… I’m scared of them now!